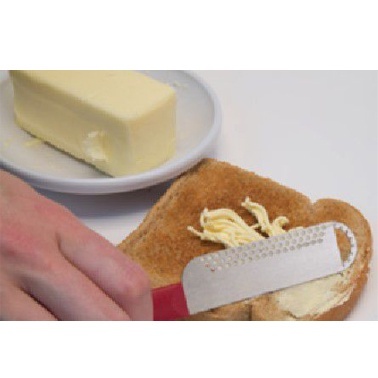 The Microplane Butter Blade is smartly engineered with a uniquely designed and shaped blade that makes using butter blissfully easy. The topside of the Butter Blade cleanly slices pats of butter and easily cuts through paper wrapping with printed measurements for accurate cooking and baking. 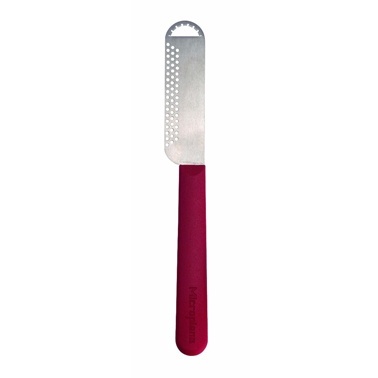 The bottom side of the Butter Blade features three rows of tiny holes that when pulled across a stick of butter, create soft strands that warm up rapidly to flawlessly spread on soft bread, toast, muffins, scones, corn on the cob, and more. 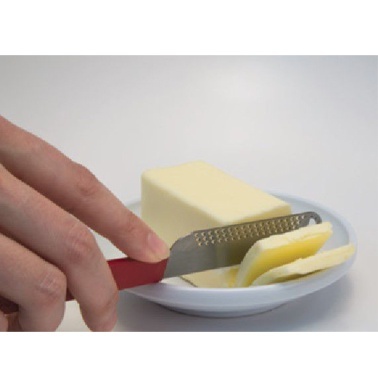 The rounded tip of the Butter Blade has an ingeniously crafted, hollow semi-circle to instantly create attractive curls by simply pulling the tip across a stick of butter. A new and efficient addition to anyone’s drawer of table knives, the dishwasher-safe Butter Blade can also be used on cream cheese.